South Africa produced a convincing victory by 66 runs against Sussex Sharks at Hove on Friday as they warmed up for their ODI series against England and the ICC Champions Trophy. In a match reduced to 32 overs because of rain, some thrilling batting from Quinton de Kock, Wayne Parnell and JP Duminy gave them a formidable score 289 for four; in reply Sussex were never in the chase but batted very respectably to make 223 for nine. South Africa were without captain AB de Villiers, who was feeling unwell. Sussex looked out of the contest when Kagiso Rabada reduced them to five for two in the first over. Chris Nash, leading the side in the absence of Luke Wright, played on to his second delivery and then Luke Wells, making his first appearance of the season after injury, was lbw to his first ball. Stiaan van Zyl, 12 times a Test player for South Africa, looked in the mood to make a point, with 16 off 10 balls, but was then athletically caught by Farhaan Behardien at backward-point. 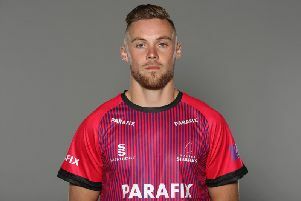 Phil Salt provided a bright feature of the Sussex innings with a 33-ball 37, which included a remarkable reverse flick over backward square-leg for six off the bowling of Dwaine Pretorius. In the next over, bowled by Morne Morkel, he struck the first two deliveries for four but was out to the final delivery, caught behind playing a ramp shot, ending a spirited fourth wicket partnership of 57 with Harry Finch. After Salt’s dismissal Finch and Delray Rawlins continued to take the attack to the South Africa bowlers. Rawlins was run out for 41 but Finch went on to top score for Sussex with 62 before he miscued to mid-off. Earlier de Kock, playing his first game since March, hit an unbeaten 78-ball 104. De Kock, who missed the IPL tournament after suffering a finger injury in New Zealand in March, retired after striking five fours and seven sixes. He and Wayne Parnell put on 121 for the first wicket before the equally aggressive Parnell, who hit 61 off 42 deliveries, with seven fours and three sixes, was out in the 15th over, lbw to van Zyl. But there was no let-off for the Sussex bowlers even after they had seen the back of the openers. JP Duminy produced the best strike rate of the innings, with 68 off 46 balls, hitting successive sixes off spinner Danny Briggs. South Africa have another warm-up game at Northampton on Sunday before facing England at Headingley on Wednesday.